Chef Tu David Phu prepares a pop-up dinner in the Golden Stateroom. A few months ago at age 32, Chef Tu David Phu was named a “Rising Star Chef” in the San Francisco Chronicle. One could say that Phu’s rise began as this son of Vietnamese immigrants worked under some of the finest chefs in Manhattan—Daniel Boulud and Jean-Georges Vongerichten, for instance. 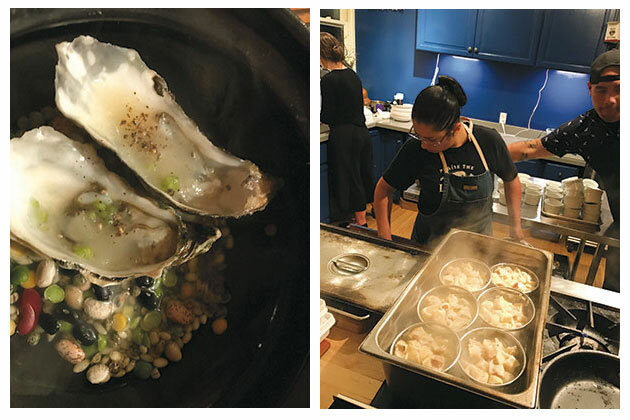 Above left: For a first course, oysters on the half-shell were flavored with lime and serrano, plus Vietnamese peppercorns from Phu’s family’s farm in Vietnam. Above right: Phu helps a sous chef cook pork and foie gras–filled wontons, which were served in consommé with brassica and ginger. Given this background, it’s no surprise that family stories play a significant role when Phu (and business partner Bryan Price) holds his nouveau Vietnamese-Californian seasonal pop-up dinners. 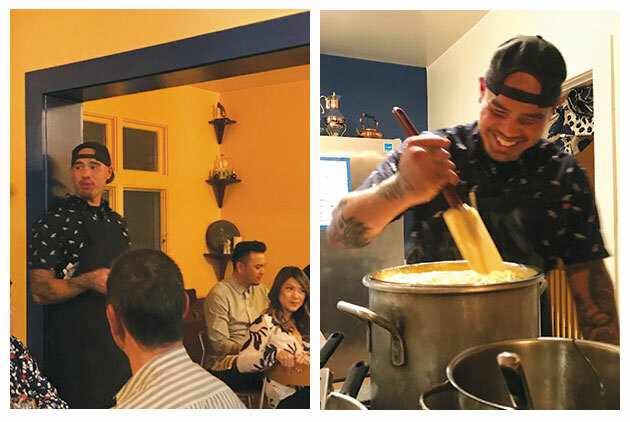 Called “Ăn” (which Phu translates as “to eat”), the dinners take place in the Golden Stateroom, an event space that’s just steps away from Oakland Tech, where Phu attended high school. Although there are servers at the pop-ups, Phu may be the one pouring hot broth into your bowl. As he serves the ceviche, he may say, “This is the last dish I ate with my grandfather before he passed.” You will also hear about Phu’s mother’s family and their enterprises back in Vietnam, where they farm peppercorns and also run their 100-year-old fish sauce–making business. Their version of that Vietnamese staple condiment is of such high quality that Phu and his parents bring bottles back to the United States in their luggage. Phu’s parents emigrated from the island of Phú Quốc, which is off the coast of Cambodia. In Oakland, his father found work as a fishmonger and his mother as a seamstress. Their aspirations for their son did not include working in a kitchen, but Phu gravitated toward it anyway. “I was the fat kid, always asking mom when the food would be ready,” he says, noting that as he helped with cooking, he developed his palate, and that by shopping with his mom, he learned how to select the best produce. “A lot of chefs pick up a phone,” he says. That means an open kitchen, and perhaps even more importantly, personally introducing each dish. He likes watching his guests interact, not only with their food but with each other. And he wants to see that look of delight when they dig in. “I’m trying to go backwards, to that food stall in another country where the cook has one burner and is making your soup,” he says. 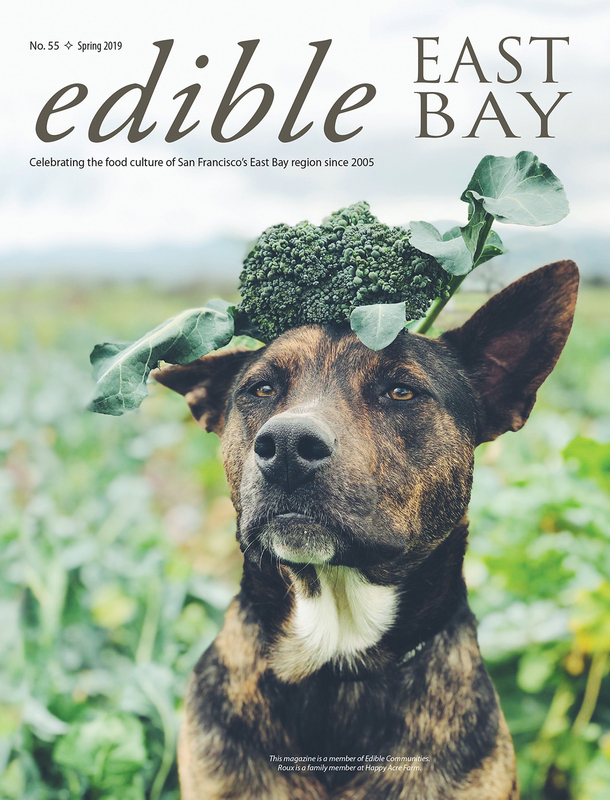 Phu graduated from San Francisco’s California Culinary Academy in 2005 and worked as a sous chef in short stints around the Bay. But he never lasted too long anywhere until he reached an unlikely destination: Saul’s Deli in Berkeley. Above left: Phu introduces each course himself, often with a family story. Above right: Not every dish on Phu’s menu seems Vietnamese. Here he prepares his homemade pasta with a creamy egg, soy, and truffle sauce. “We called him Tu ‘the Jew’ Phu,” says Levitt, adding that Phu was a “diamond in the rough” but still “loveable” when he arrived at Saul’s at age 23. But clearly Phu wasn’t meant to stay at Saul’s. Phu also did a stint at Gather after its founding chef left, but departed over ideological differences. Phu credits Anthony Bourdain for giving Vietnamese food its proper respect as he opened Westerners’ minds and palates to that range of flavors and types of dishes. Phu’s tasting menus are full of ideas he’s been thinking up for the past 12 years while at all his other jobs. Phu’s menus start out with tastes so subtle that diners might think a dish needs more seasoning. But it’s deliberate: He slowly wakes up the palate by incrementally introducing stronger flavors. 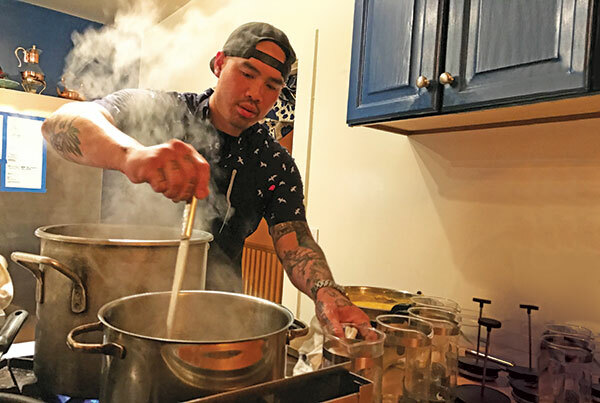 It’s not uncommon to find other local chefs supporting Phu at his pop-ups. Here, Nora Dunning (lower center), executive chef and partner at West Oakland’s new Drip Line café and bakery, enjoys a convivial evening at Ăn. In this writer’s opinion, Phu’s pineapple chili sauce with notes of lemongrass should be bottled and sold. A beef tenderloin wrapped in seaweed (Phu often dives for that vegetable himself) is an umami bomb. Silken tofu, which he makes à la minute from a gallon of fresh Hodo Soy milk and serves with ginger syrup and a touch of gold leaf, made me doubt that I had ever truly tried silken tofu before. Phu says the pop-up concept is working for him now, but adds that he can see having his own brick-and-mortar restaurant some day, as long as it’s intimate enough that he can see and interact with his guests (which quite often means hugging some of them as they depart). It’s a concept that Phu’s guests like Russ Nelson of Oakland appreciate. On the night we both dined at Ăn he said it was his sixth or seventh time at one of Chef Tu’s dinners. A fan of the concept overall, Nelson describes Phu as one of his favorite Feastly chefs. A contributing editor of j. weekly, Alix Wall is an Oakland-based freelance writer and personal chef. She is also the founder of The Illuminoshi: The Not-So-Secret Society of Bay Area Jewish Food Professionals and is writer/producer of a documentary-in-progress called The Lonely Child. Find her at theorganicepicure.com or on twitter @WallAlix. “I always get a lot of questions on how to use lemongrass. The most common remark is, ‘I never seem to extract the lemongrass flavor.’ My answer is that you have to use a lot of lemongrass, and that you will either have to bruise the stalk or chop it very finely. Prepare lemongrass by cutting away the bottom half inch of the stalk. (This part is very woody and should be saved for broths or soups.) Cut the stalks into ½-inch segments and chop finely in a food processor. Add garlic cloves, fish sauce, and sugar. Blend to a fine paste, about 1 minute. Place beef into a zip-top bag with the marinade, making sure to coat all of the beef. Seal and marinate overnight or 8 hours*. Remove the beef from the refrigerator 30 minutes before cooking. Drain away marinade before cooking to your liking. Letting the beef rest for about 10 minutes before slicing will help it retain the juices. 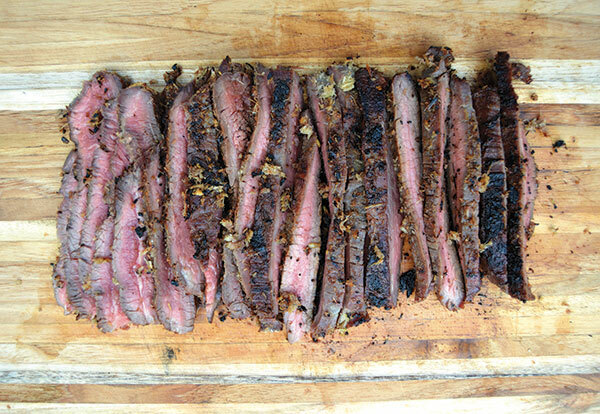 *Note: If you have a sous vide machine, there’s no need to marinate. Set machine and water to 140° and let it sit for 2 hours. Then cook to your liking.